We have added therapeutic laser therapy to our treatment options at Lakeside Veterinary Clinic in our continuing effort to provide the highest standard of care for our patients. Class IV deep tissue laser therapy uses a beam of laser light to deeply penetrate tissue without damaging it. 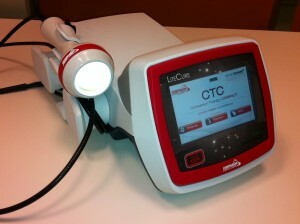 Laser energy induces a biological response in the cells called “photo-bio-modulation”. The clinical outcome of this deep penetrating photobiomodulation is pain relief, reduction of inflammation, and increased microcirculation within the tissues thus accelerating healing. The laser light is delivered through a noninvasive handpiece to the affected area. Your pet may feel a gentle and soothing warmth. Most treatments take a matter of minutes. Class IV deep tissue laser therapy is FDA approved and has been scientifically proven to be successful in treating post-surgical pain and many acute and chronic conditions.This list is not complete, but illustrates the versatility of this new modality.